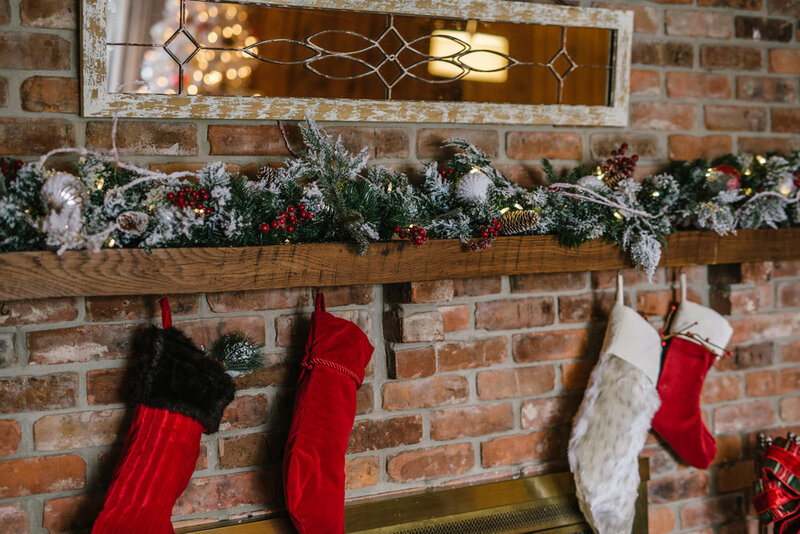 Family room mantle decked in Christmas Morning Frost garland. Photography by Rachel Cuthbert Photography. Welcome! I’m excited to be kicking off Tree Classics Home for the Holidays blog tour. One of my favorite things about being the brand spokesperson for Tree Classics is decorating for Christmas early, previewing some of their new product, and “window shopping” other bloggers holiday decor! 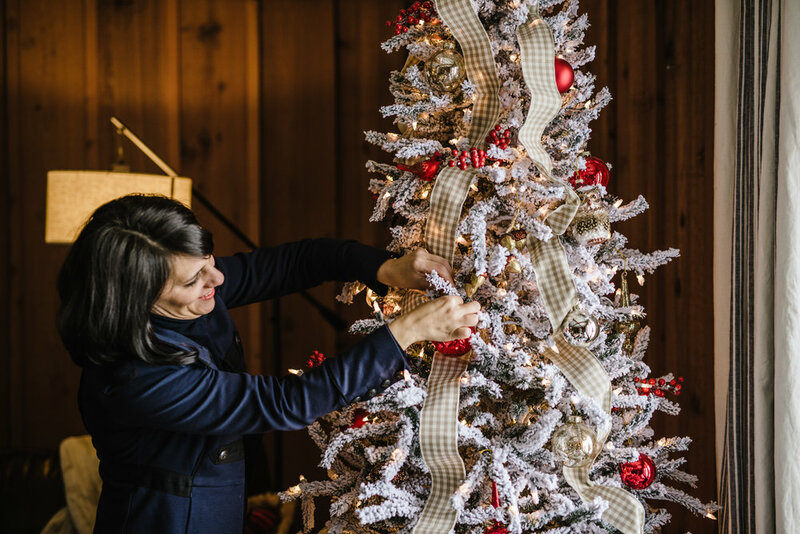 Today I’m sharing with you some our favorite holiday traditions along with our family room decked in holiday finest and a few tips for decorating like a pro. Perhaps it’s cliché, but Christmas really is the most wonderful time of the year. It’s as if the world takes pause, for even a half second to celebrate what is good and beautiful and true. We do this by decorating, baking and cooking, gathering those we love and hold dear, sharing meals together, and gifting our time and resources. And over time these activities create indelible traditions and memories. Christmas music!!! Again, a bit cheesy, but it makes me so happy! On to decorating! I began “decking the halls” in our family room. Tree Classics has fun new product this year—Christmas Morning Frost Wreath and Garland set as well as new ornaments and tree skirts. 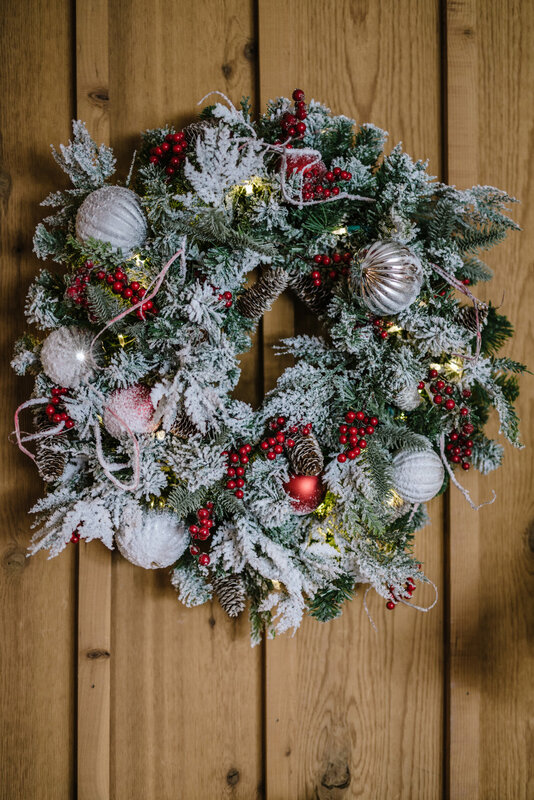 Our family room has a rustic feel with knotty pine unfinished planked walls, and I immediately knew that woodland ornaments along with my Flocked Alpine Spruce tree, and Christmas Morning Frost wreath and garland set would create a beautiful winter woodland landscape. 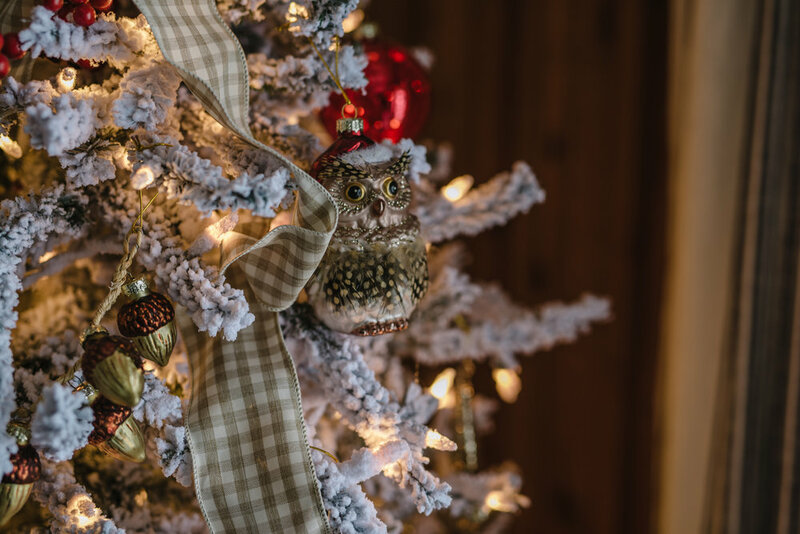 A few quick designer tips… Really fluff your tree, garland and wreaths. I’ve linked to a short video of me going through the steps of fluffing a tree. The beauty of pre-lit Tree Classics greens is that they look full and real, and you can adjust the branches to look fuller and fit ornaments (we call it fluffing). In the inside of your tree, fill the holes and blank space by moving your branches upward to mimic a peacock feather. For exterior branches, look at the picture of the tree online and shape your branches up or down accordingly. I promise, you will be much happier with the end product if you take the time to fluff your branches. Fluff your tree branches for the best shape & fullness! Other notes, I always keep twine, green floral wire, green pipe cleaners, wire cutters, and command strips on hand. 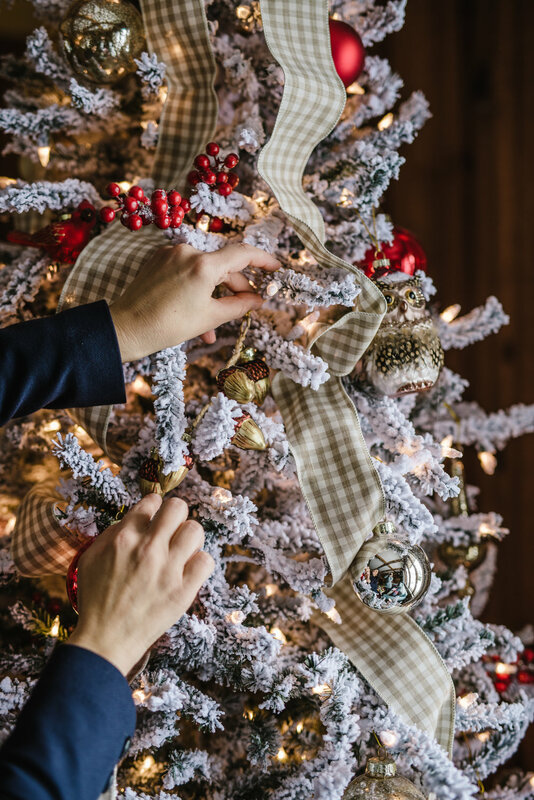 To get a really designer look, I will wire ornaments to branches—so that they hang perfect. You have more control with a wired ornament—you can hang lower or higher. Command strip are amazing for hanging holiday pictures, wreaths, and garland, but you do have to have the right surfaces. Command strips don’t work as well on uneven surfaces such as the wood in my family room. I added the lovely Woodlands Collection ornaments to the tree. I really like the detail in these ornaments—the owl has real feathers & the cardinal is beautiful. The red berry tree picks add color and texture—they even have a bit of crystal sanding to mimic snow & add sparkle. I often add ribbon and, for this tree, added gingham ribbon that I purchased at Michael’s earlier in the year. Two of my favorites from the collections—the strand of acorns and the owl with real feathers. Love the attention to detail! For the tree skirt, I chose Tree Classic’s Rustic Plaid Faux fur tree skirt. Seriously love this! We live in Michigan, and I love anything that looks & feels cozy during the winter months. Sort of related side note: I just ordered winter boots with shearling lining and am currently looking for the warmest winter coat I can find—faux fur trim would be a bonus! If anyone has favorite WARM winter coats, let me know. To tie together the tree and give a cohesive look, I try to use wrapping paper and ribbon that coordinates with the tree. Home Goods and Ikea are two of my favorite places to shop for these items. In this picture, both wrapping papers are from Ikea. While I used some new product for the woodlands collection for the tree, for my fireplace and piano—I mixed and matched product this year. Tree Classics has a rustic wreath and garland set, but I wanted to carry the flocked look over to my mantle. Again, I just really like how the flocked brightens up my wood paneling. Often, I will swag my garland, but this year decided to place the garland on the mantle. It’s so rich and full with red and silver ornaments, berries and pinecones that I didn’t need much extra décor. I found a fun mirror at one of my favorite local specialty shops, MaryBeth’s. There is very little room between the ceiling beams and the mantle, and this distressed, narrow mirror was a perfect addition. Hanging it was a bit tricky, but gratefully, I had wired twine on hand, and it seems to be hung securely. For the piano, I placed the garland and added candlestick holders that I found last year at a resale shop, along with the lamp that usually sits at the piano. Finally, I hung the wreath above the piano—so far I haven’t added ribbon, but may still add one. And that’s it—my tips for creating an inviting home for the holidays! 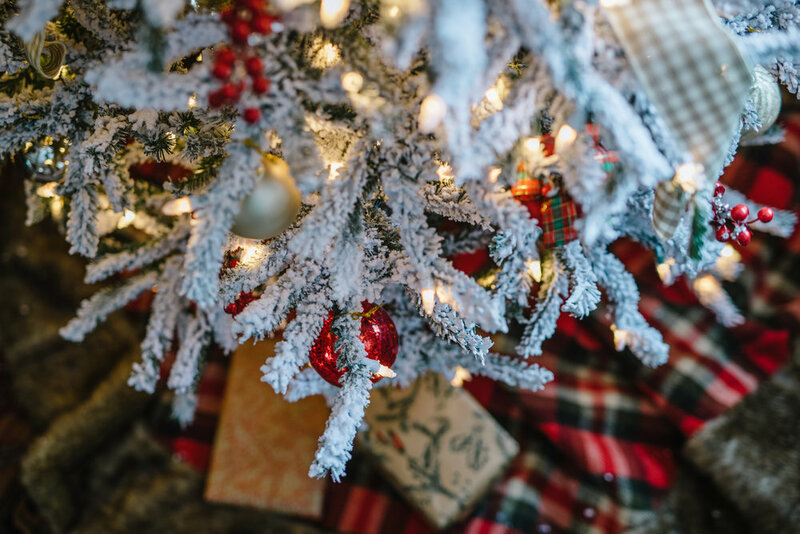 Check out my fellow bloggers who will also share their décor and favorite holiday traditions. And please, share your traditions as well and let me know if I can answer any tree questions.